Dialysis Clinic, Inc. | 40 years on dialysis and going strong! 15 Nov 40 years on dialysis and going strong! Ken Flodine of the DCI North Versailles clinic in Pennsylvania reached a milestone on November 6 this year – 40 years since his first dialysis treatment ever on November 6, 1976. Ken was 19 in 1976, a recent high school graduate. He was attending college at Community College of Allegheny County (Boyce Campus) when he became ill and needed to start hemodialysis. Ken says he was born with a narrowing in his bladder. Tubes were placed that led to his kidneys, and this eventually led to his kidneys losing function. Ken received dialysis three times per week at West Penn Hospital in Pittsburgh until August 16, 1977 (“the day Elvis died,” he remembers) when he received a kidney transplant from his mother at Cleveland Clinic in Ohio. Unfortunately, this transplant only lasted until February of 1978, at which time Ken started back on dialysis at West Penn Hospital. A second transplant came in winter of 1980, but unfortunately this one never functioned. Despite the failed transplants, in 1982, Ken graduated from Robert Morris College in Pittsburgh with a bachelor’s degree in Sports Management. Ken had two more failed transplants, in 1988 and the early ‘90s at UPMC Hospital in Pittsburgh. He worked for Zayre’s Department Store (later bought by Ames), from 1986 until 2002, and he remains an avid sports fan – especially of the Pittsburgh Steelers, Penguins, and Pirates. In 2002, Ken transferred in to the DCI-North Versailles clinic, as it was much closer to his home. 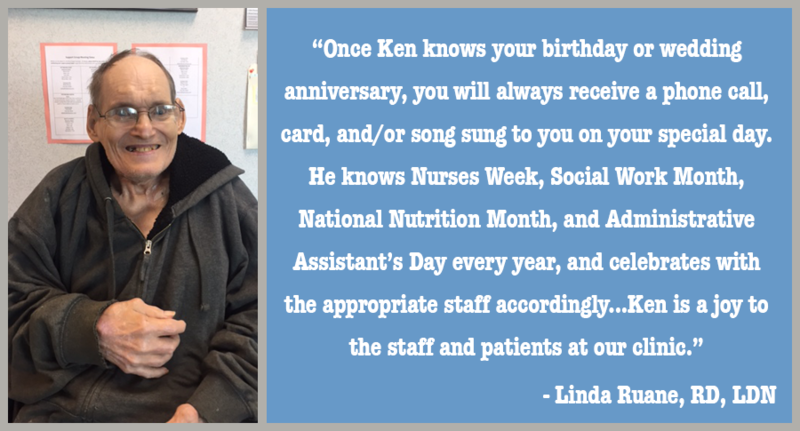 Congratulations on 40 years on dialysis, Ken, and here’s to many more!